* This is my article in BusinessWorld last February 27, 2017. As the world modernizes and people’s productivity keeps rising with technology, the opportunity to escape poverty increases. But many developing countries fail to take advantage of this modernization because of politics. It’s like being under an autocratic rule, a democratic but very bureaucratic and tax-hungry government, or an on-going conflict with armed communist rebels. The federalism campaign by the Duterte administration and his PDP-Laban Party is humming along far and wide across the country. In their analysis, federalism is the answer to a highly centralized unitary Philippine government centered in Manila. There are merits to this argument. The degree of bureaucratism and corruption in the country has not significantly improved since the downfall of the Marcos administration more than three decades ago. Hence the desire of many people in the provinces to have more power in charting their own future. 1. Very low national taxes, only around 5% income tax and 5% VAT and to encourage tax competition among states. Some will impose a 35% income tax (or total of 40% income tax) and no more VAT, others will impose 15% income tax and 7% VAT (or total of 20% income tax and 12% VAT), others will have zero income tax and 10% VAT, and so on. 2. Abolish several national regulatory agencies or drastically reduce their powers and allow the states to have regulatory and infrastructure competition. Some will require power plants to secure six-year permits while others will require only 6 months, and so on. 3. Abolish some departments and allow the states to put up their own with their own budget and staff and have governance or social services competition. Candidate departments that can be abolished are NEDA, DAR, DA, DoH, DepEd, DENR, DoE, and so on. These proposals will be unpalatable to many central planners in the government. They are bright, have MAs and PhDs, have long work experience with global central planning agencies like the UN and World Bank. The national politicians will also dislike these moves because they are bright and experienced in national politics and government, so why deprive them the privilege to direct huge agencies and departments? 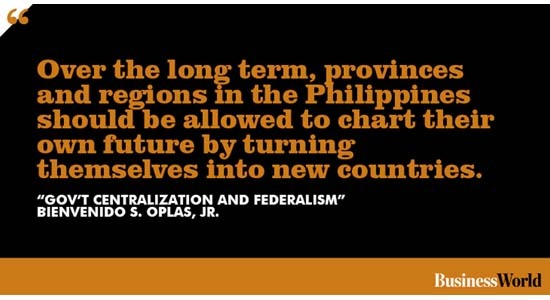 In the absence of meaningful federalism, island-provinces and regions over the long term should be allowed to chart their own future by disengaging from the Philippines and turning themselves into new countries. 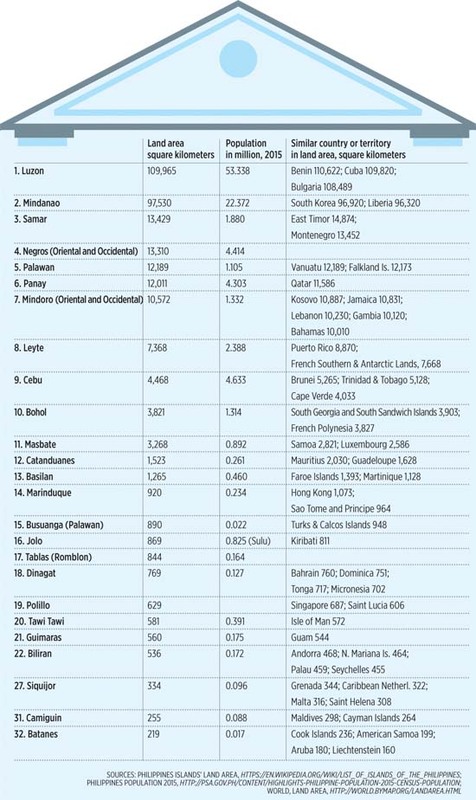 There are many countries and territories that are much smaller than the Philippines both in land area and population but are doing well and the most visible examples are Hong Kong and Singapore. Below is a list of big islands in the Philippines and their comparable countries and territories in land area around the world (see table). These new countries will treat each other like we currently treat our neighbors in the ASEAN with free trade in goods and freer mobility of people without any need for visa for visits of 30 days or less, and so on. It is hardly possible for a country with an expanding population to become less bureaucratic and less tax-hungry because less bureaucracy would mean more innovation and more wealth for the citizens while other regions remain poor and many agencies and planners dislike more inequality. This is a long shot view and may not get public support for now. But as the world progresses quickly, more people will become more impatient for faster change and improvement in their lives. Governments and regulators should learn to step back and respect more individual innovations.